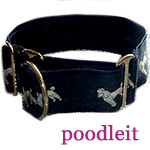 Poodle Blogger: Identify these Poodles and Win, Win, Win!!! A wonderful surprise came in the mail this week--an entire CD of Poodle photos taken at a recent Poodle party up at Poodle Mountain in New Hampshire. 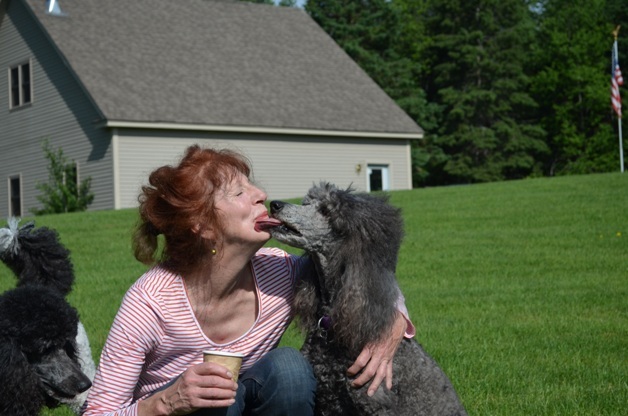 I call this one "the real reason lots of folks call them "french Poodles"! But I desperately need your help, as i don't know the names of the Poodles or the people in most of the photos. So let's have a contest! OK, OK, I know...you're thinking....not fair, because perhaps you were not fortunate enough to be up at the Poodle party because maybe, like me, you are down south and cannot travel all the way to New Hampshire at the drop of a hat. So if you want to enter and don't know the dog's name, then just submit a cute caption instead. To make things a bit more fair, I'll throw in a photo every now and then that you should be able to identify just from reading this blog, Poodles who are "regulars" here (but were not at the poodle party, such as the Poodle actors from Canine Horizons, or one of those featured in photographer Chris L'Abbe's work which she often shares on the Poodle blog, or photos shared by my Poodle friends Jeanne Haight and Donna Trebert). Remember these guys pictured above? If you don't know their names, remember you can enter just by submitting a caption! So expect some very cute Poodle photos coming through soon....we'll post about 25 and see which reader has correctly guessed names or added an adorable caption the most often. Future photos will come through with a quick link to this post, so we won't have to repeat the "rules" every time. All entries must be as comments on the blog, so encourage your dog friends to become blog followers and commenters! The winner will receive a $30 gift certificate to Amazon, where you can find just about anything, from Poodle toys to people toys! Many thanks to our blog photo contributors--Rick Miles, Chris L'Abbe, Jeanne Haight,Donna Trebert, Charlene Dunlap of Canine Horizons and more! 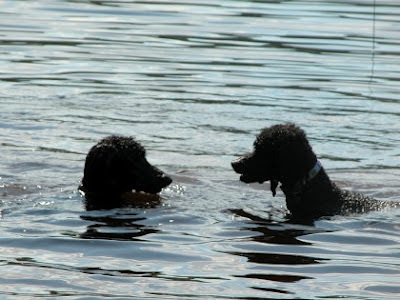 Contest ends on or about the end of August, or whenever at least 25 adorable photos full of Poodle fun have been posted! So have all your friends start following the Poodle Blogger and entering today by identifying the models, or giving them a great caption! Remember the prize is something anyone can use, you can always pass it along to your favorite dog rescue group if you are not an Amazon shopper yourself. Enjoy! 1. Is your end of the cookie as good as mine! 2. Did you let the duck float away? Did YOU make those bubbles? Judy, I love that "is your end of the cookie as good as mine!" caption, it is perfect for that top photo! Did you see the bikini cut on that one? !